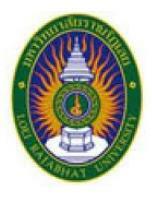 Loei Rajabhat University was founded as Teachers’ College on 29 September 1973 to provide an educational field. On 19 January 1995, his majesty the king Bhumibol Adulyadet graciously conferred the name “Rajabhat Institute” on the teacher colleges across the nation. The Rajabhat Act of 1995 brought changes to administration and autonomy of all colleges. An effect of these changes has been to create 41 locally oriented and autonomous institutions, endowed with a great flexibility and capability to provide for country’s future educational needs. Up to now, Loei Rajabhat University have diversified their curricula to train manpower in various fields under five faculties including Education, Humanities and Social Sciences, Management, Industrial Technology, Science and Technology. Later, Master’s and a doctoral degree are offered. Loei Rajabhat University is a Leading University of Learning Organization, Integrating Local and International Disciplines for Rural Development towards the Greater Mekong Sub-region.